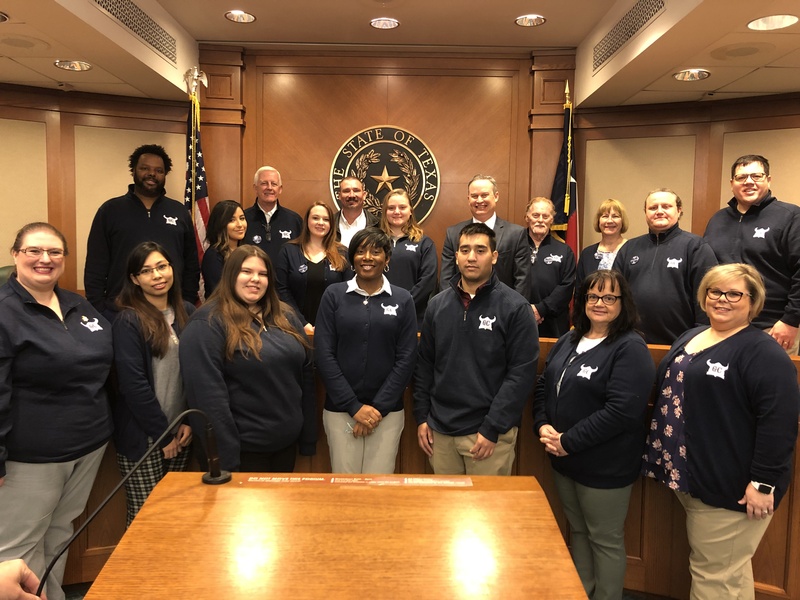 Grayson College students, administrators and Board of Trustees members gathered in Austin today to participate in the annual Community College Day event hosted by The Texas Association of Community Colleges and the Texas Association of Community College Marketers. This event provides an opportunity for Texas college students to engage with their elected officials and discuss issues relevant to them and higher education. “We are extremely grateful that our students are about to share with our representatives the impact of our college and the importance of investing in community colleges,” GC President Dr. Jeremy McMillen said. In addition to visits with legislators, students have the opportunity to hear remarks from higher education leaders as well as interview various state senators and representatives. Students and legislators will discuss legislative priorities for education in 2019 and the issues that ultimately affect students. These issues include – funding, dual credit and workforce among others. ABOUT: TACC is a nonprofit organization that represents 50 public community college districts. Our primary mission is advocacy to help lead policy development, innovation and institutional practices in higher education. We provide a common voice on behalf of member colleges during the Texas Legislative session and build relationships with state policymakers during non-session years. This voice promotes the sustainability of, and equity among, community college districts across the great state of Texas. Attachment: Photo of State Rep. Reggie Smith with Grayson College President Dr. Jeremy McMillen, students, administrators and Board of Trustees members gathered in Austin today to participate in the annual Community College Day event. Please reach out to GC Marketing & Public Relations Coordinator Rhea Bermel with any questions – 903.647.8342 or bermelr@grayson.edu.